I’m a little late to the Friday Fictioneers party, but I’m still getting a hang of my new schedule so bear with me. The prompt this week dealt with spiders, so in keeping with a lot of my posts recently I went creepy with it. I’m not sure whether I like this one or this earlier post better when it comes to my spider-related writings, but I’ll let you be the judge. Thanks, as always, to Madison Woods for hosting the prompts, and thanks to Rochelle Wisoff-Fields for providing this week’s picture. So dark. Black. And without time, just like death. 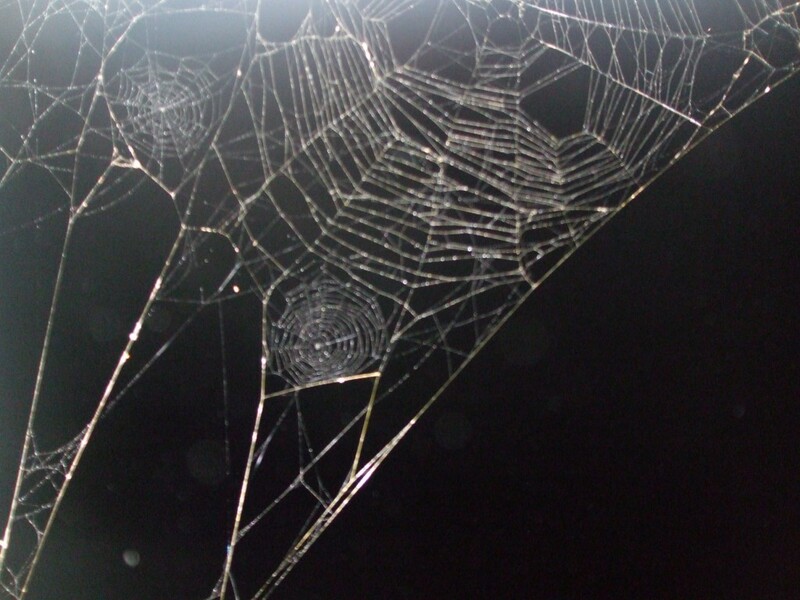 I hardly noticed it at first – the gentle, sticky tug of the spider webs – but now I feel their silky strands twined about my neck and threaded through my fingers. The tiny legs that tickle my skin, the poison bites that make me itch. I need my medicine but I cannot scream – I cannot whisper; If I do, they’ll fill my mouth and skitter down my throat and build their nests in my lungs. But oh! I cannot plug my nose or stop up my ears, so now they’re in my brain and they know my thoughts. The spiders are in my brain and I am dying and they know my thoughts, just like God. Check out the other links in the collection and leave whatever comments, criticism or random musings you feel the occasion calls for below! A well written nightmare. I hated it…but in a good way. I’m going to go wash my hair now and hope to find no spiders or webs. But they are amazing engineers, aren’t they? They definitely are – but the psychological ones have fewer nice qualities I’d say. Thanks for the comments! Skin-crawlingly good, and spiders skittering down into your lungs? – that’s just SO disgusting! In a good way. Haha, thank you thank you. I appreciate it! ew,ew,ew! I’m really going to have to avoid FF if there’s a creepy prompt again. You guys are sick! Pretty comprehensive creepiness! I’m mostly worried about the mental state of the narrator–if this is not physical reality, how much worse the reality of his inner landscape?! I do hope he gets his meds! Well done. why compare the spiders to god? I wanted to show that this whole thing was psychological, and hint at a kind of paranoia / psychosis where he feels like the spiders aren’t just physically in his brain, but listening in on his thoughts. In his case, that omniscience relates them to God, because of what I imagined his beliefs to be like. Just my attempt at giving it some depth I reckon. Time to clean the cobwebs out of my room. They are taking over. 🙂 Nice story! If you waqnt to increase your knowledge just keeep visiting this website and be updated woth the newest news posted here.